Our time on the beautiful Belize island of Caye Caulker was the most expensive part of our trip but it was well worth the money. We had a great time here and saw the wonders of the second largest reef in the world! We arrived into Belize with a “hello” (they speak English here as it is part of the Commonwealth) and our shuttle from Flores, Guatemala took us straight to the Belize Water Taxi ferry terminal in Belize city. Belize City is nothing special and we wouldn’t recommend spending anytime there so we jumped straight on the next water taxi to Caye Caulker. The cost for the taxi can be up to $15USD per person one way to the island, but we were lucky on our return to get the water taxi half price so keep a look out for any deals. The water taxi takes about 45min and drops you right in the middle of town where you are greeted by golf cart taxis and hotel owners. We opted to walk to our accommodation which was easy. We stayed at Raul’s Rooms which was nothing fancy, but is was reasonably priced ($37USD per night), clean and an easy walk to all the main areas on the island. What was most surprising about Caye Caulker is the chilled out Rastafarian vibe, expect to hear reggae everywhere! There are also virtually no cars, mostly only golf carts and bicycles. The streets are also just small sandy lanes. However, be warned that there is not really a beach on Caye Caulker, but the Lazy Lizard at the split provides a deck where you can get a beer, relax in the sun and jump into the clear blue waters for a swim. Some people even swam across the split, but be careful as boats speed through and the current can be strong. The restaurants in Caye Caulker provide an abundance of seafood and BBQ jerk chicken! Most of the time you can choose your own fish from the front of the restaurant and they will cook it up for you. However, as we said Belize is not a cheap place, but the food we had on the island was good and you can find deals for about B$15 (Belize dollars) for Jerk Chicken, desert and rum punch! Did I mention rum punch is also everywhere! There are also many places offering street BBQ, but some of these places can be more expensive than restaurants, but again some offer all you can drink rum punch so it might be worth it. We also found a nice cafe Caribbean Colors Art Cafe which was our go to place for breakfast and coffee, they do this large serving of banana pancakes for B$8 which was a perfect breakfast for us. The cafe only employees single mothers so it also helps ladies in the community find work! There is not a huge party scene on Caye Calker although there are a few bars around town. We went to the Barrier Reef Sports Bar & Grill for one of their twice weekly trivia nights (Wed & Sun) with a few new friends from the snorkel tour, it was a great night that ended with a 3rd place bar tab prize and dancing on tables for free shots. One of the best things we have ever done was the Raggamuffin snorkelling trip. The main reason we came to Belize was to snorkel the barrier reef and we were recommended Raggamuffin Tours from some other travellers so opted for their Hoi Chan Snorkel day trip, at $70 USD per person it was pricy but it included lunch, non-alcoholic drinks during the day, was on a sail boat and they provided all you can drink rum punch on the way back! They also take you to 3 different locations, Coral Gardens, Shark Alley and Hol Chan Marine Reserve. 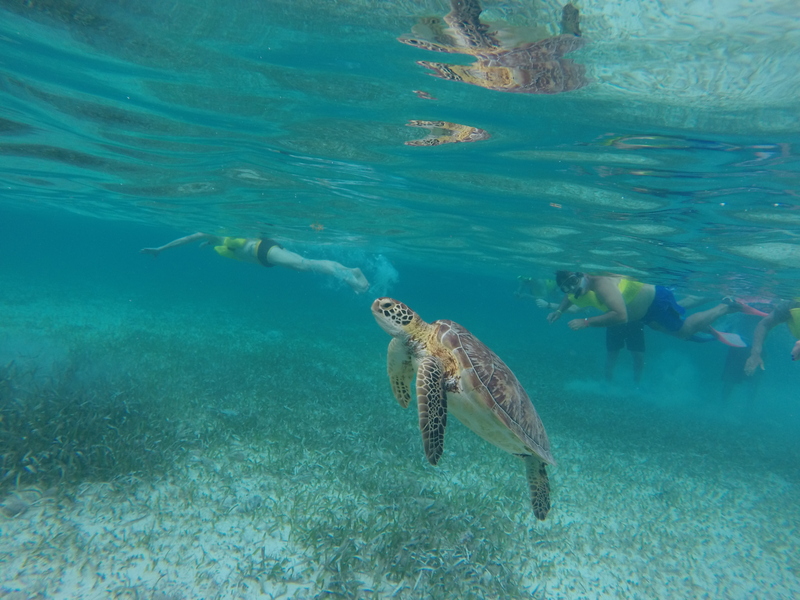 The snorkel trips are also guided so you get to learn all about the amazing reef system and the marine animals that live within it. It was really magical watching an Eagle Ray fly through the water, see the abundance of stingrays and nurse sharks, there were hundreds of tropical fish, beautiful corals, a few moray eels and the best of all a very friendly sea turtle. Seeing these wonderful creatures in the wild was a really special experience and left everyone on the trip buzzing. We cranked the reggae and got stuck into the rum punch for the hour and a half boat ride back to the island of Caye Calker. There was penalty of dancing and good times had by all. Belize has an exit tax of B$37 and all tourists have to pay this, even if you are only passing through the country. We also used a local chicken bus to get to the Belize/Mexico border. You can get this from the main bus terminal in Belize City and it is only B$11, much cheaper than the $25USD buses offered at the Water taxi Terminal. From the border you can walk to Mexico and get a taxi to Lake Bacalar for 150-200 pesos. Overall, Caye Caulker was a great place to visit, perhaps it would have been better if we were not on a budget as the island offers many other amazing marine trips, such as a Manatee tour and diving the famous Blue Hole. Next Realities of our trip #4 – Good morning Vietnam! Love this post! Your photos are delicious and the food looks beautiful (lol). I plan on going to Caye Caulker one day so this was great to read.